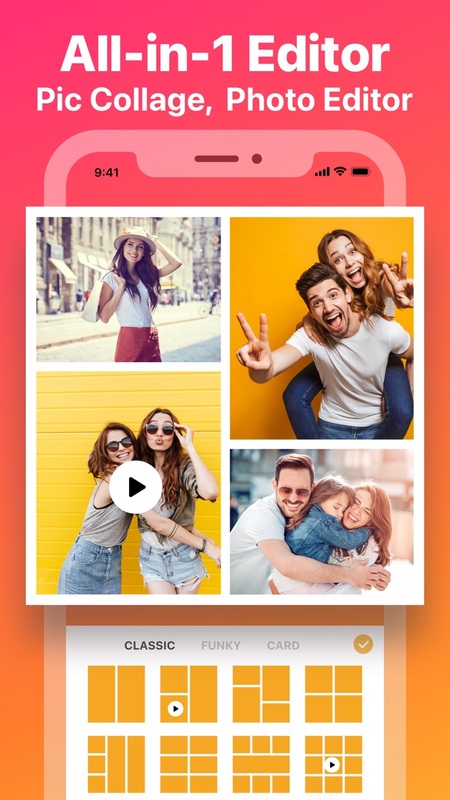 100 million+ installs, Collage Maker ◈ - LiveCollage is the #1 photo editor & pic collage maker on mobile. Download the best, the easiest app for editing photos and videos, making perfect free cards. Choose from trendy grid layouts, collage styles and sizes, awesome effects, exclusive stickers, background patterns, gradients and doodle on collages to TELL YOUR STORY with one framed picture! And edit & touch up your pics, videos with powerful editing tools, filters, beauty retouch essentials. - 5000+ STYLISH Layouts in different shapes, sizes, styles! Mix-match your photos, crop, rotate, move and set them up as you like. - Thousands of EXCLUSIVE stickers, backgrounds, patterns, frames to beautify & decorate your photos and stories. - Use FREESTYLE to make a SCRAPBOOK of special moments & memories. - DOODLE and write on your photos in your own unique handwriting. - CUTOUT photos by tracing shapes with your finger. - Smooth out your skin and fix any flaws with Beauty RETOUCH Tools. - Make photos into SLIDESHOW with powerful video editor. - Video Collage Maker:Video imported for all layouts. Easily and quickly to make video collage in seconds. Fully ADJUSTABLE basic layout by adjusting the FRAME,COLORS and PATTERNS. Add colorful TEXT & next trending MEME with funky FONTS to make them even more expressive! - Aspect Ratios for fb cover/post, twitter post, iPhone wallpaper. Trendy filters, touch-up tools(CROP, DRAW, REDEYE, BLEMISH, etc) and more! $39.99/year subscriptions that provides access to entire collection of collage layouts, cards, effects, backgrounds, stickers and more! And to access our exclusive set of Features. New content update monthly! These subscriptions auto-renews at the end of each month or year.unless cancelled 24-hours in advance. The subscription fee is charged to your iTunes account at confirmation of purchase. You may manage your subscription and turn off auto-renewal by going to your Settings after purchase. No cancellation of the current subscription is allowed during active period. Crash bug fixes and can't delete sticker/text bug fixes in FreeStyle collage mode. Support to add GIF from GPHY to Collage, Photo Editor, FreeStyle. A GIF is worth a thousand words. Just with one tap to add so many funny, cool GIFs to your collage and photo. Support to add image from Bing search to Collage, Photo Editor, FreeStyle. Now you can free your mind to make more creative, fun art works with tons of free web photos, images. You can use all gradient colors and patterns backgrounds for text color/text background. Set background with web images from Bing search. Add 7 creative fonts, 5 outline fonts,13 script fonts,4 sketch fonts. Add A0,A1,A2,A3,A4,A5,A6,letter,legal ratio for Photo Editor, FreeStyle Collage. 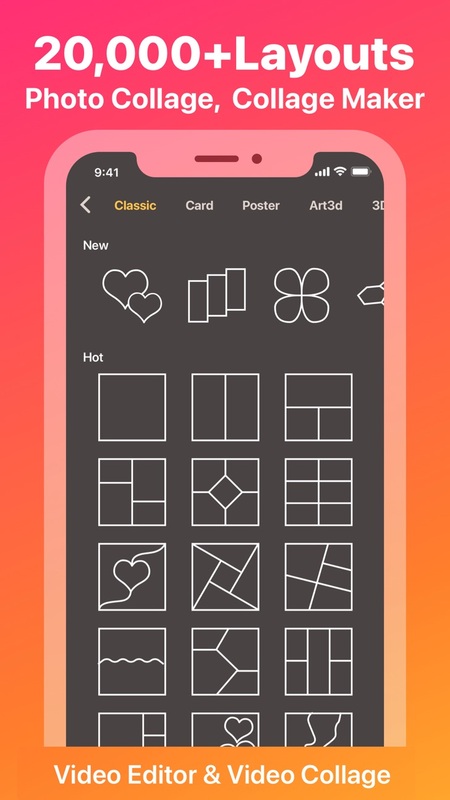 Edit sticker with more functions: cutout, apply filter, adjust tools(exposure, contrast, sharpen, saturation, tint, temperature, clarity), fill with color, set outline around sticker's edge. Move photo/text/sticker with finger easily in 1pixel move mode. Exported collage video slow bug fixes. Optimize canvas display when background is set to transparent color. Many bug fixes and performance improvement. BTW, more tools and features coming soon at April at 9.0.0! A very cool text designer for your photo, collage, video. With one tap you can make very professional looking and fantastic text in seconds. Support video imported for all collage layouts. You can easily and quickly to make video collage in seconds. Make amazing curved text to make your photo standouts and get more likes. 1 Pixel moving dashboard let you make text,photo,sticker percison adjustment. Now free your mind to create creative and cool texts for your photos and videos with our new powerful Text Editor. any colors on the canvas, then use them for background,text color,etc. your own colors in precision way. Now you can move text,photo,sticker in 1 pixel very easy. Precision adjustment was never so easy. Easy and handy Layer Manager for Photo Editor, Collage Maker. Add 10creative and fun Emoji brushes to doodle on photo. Reset added stickers & images to original state if you want to cancel your edit on stickers,photos. Aspect fit for all canvas size for Photo Editor. Optimize doodle functions and more easy to draw. Some classic layouts can't adjust margin bug fixes. Fix other bugs and improve performance.